As temperatures rise, watch calves closely for early signs of dehydration. As summer heats up, you may find yourself spending more time in the pool, enjoying ice-cold drinks and sitting in air conditioning to keep cool. Calves also behave differently in the summer to avoid heat stress. By providing your calves with a proper environment and good management, you can help reduce heat stress from harming your calves. The most important aspect of summertime calf raising is to provide free-choice, fresh water. Calves exposed to heat stress can consume up to 3 to 6 gallons of water each day. It is important to check availability and cleanliness of water a few times daily. Modifying your calves’ environment is one of the best ways to protect them from the weather. Reducing sun exposure can help keep calves cool as temperatures rise. Calf hutches and shelters that completely block the sun are better for keeping calves cool than opaque shelters. Improving air flow in calves’ environment can also help keep calves cool. Naturally ventilated buildings should have all vents open. Use fans as an additional source of air flow. If you can smell ammonia in the barn, or see condensation on the walls or ceiling, it may be a sign the barn does not have adequate ventilation and should be modified. Closely monitor calf starter freshness during hot weather to avoid mold growth or excessive fines left in the bucket. If possible, there should be a solid partition or enough space between water and grain buckets to prevent calves from transferring water into the grain bucket. Stressful events can include moving, grouping new calves together, vaccinating or dehorning. Plan to perform stressful events in the morning. Evening temperatures seem cool, but animal body temperature lags the weather by four to six hours, making morning hours the best time to work with calves. Behavior is another great way to monitor a calf’s hydration level. If a calf is sluggish, slow to eat or respond during feeding time, it may be dehydrated. If your calves show any signs of dehydration, it is important to begin feeding electrolytes to help restore hydration. Electrolyte supplements do not contain all the nutrients of milk replacer, so be sure to offer electrolytes in addition to the calf’s normal diet. 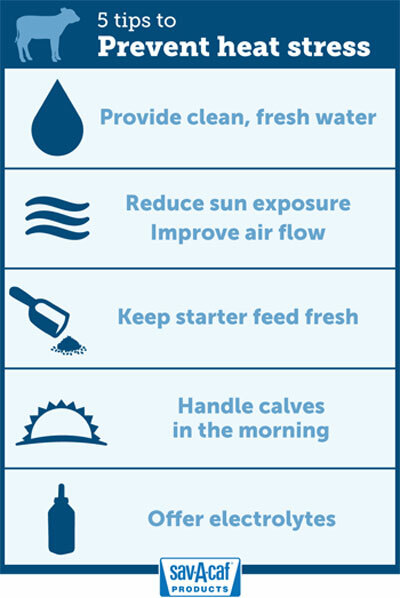 For more information about keeping your calves cool or to find out more about their nutritional needs, visit: savacaf.com or like My Farm Journey on Facebook.